After Disney established its East Coast home in the once-sleepy Orlando area, Florida evolved into the theme park capital of the world. Disney World's original park, the Magic Kingdom, boasts the highest attendance of any other park on the planet. But Universal Orlando, which has been growing by leaps and bounds both in attendance and in the quality of its parks and other experiences, is nipping at Disney's heels. While the two giants battle for supremacy, there are are many other noteworthy parks, including Busch Gardens Tampa, Legoland Florida, and SeaWorld Orlando. Let's explore these and other Florida parks, including some of the smaller, lesser-known ones. Many of the state's theme parks have affiliated water parks. There are also many standalone water parks in Florida. With so many theme parks, you'd expect to find plenty of​ great roller coasters in the state. And you'd be right. These Florida theme parks and amusement parks are arranged alphabetically. It's a thrill ride park. It's a zoo. It's two parks in one! And it's worth the one-hour-or-so journey south from the Orlando area. Among its world-class coasters are the incredible inverted ride, Montu, the wild diving coaster, SheiKra, and the exhilarating launched coaster, Cheetah Hunt. SeaWorld Orlando's sister attraction lets guests get up close and personal with dolphins and other animals for a unique boutique theme park experience. ​Its somewhat hefty admission price includes all attractions, the swim-with-dolphins experience, meals, and a 14-day pass to either SeaWorld Orlando, Busch Gardens Tampa, or Aquatica water park. It's not quite a zoo, nor is it quite a ride-loaded theme park. But Walt Disney World takes a dash of both, mixes it with pixie dust, and creates a unique and engaging hybrid experience. Highlights include Pandora: The World of Avatar, the Kilimanjaro Safaris, the thrilling coaster, ​Expedition Everest, and Finding Nemo- The Musical. The smallest of the four Walt Disney World parks, Disney's Hollywood Studios (which used to be known as Disney-MGM Studios) is a bustling paean to the Hollywood of your dreams. With the Twilight Zone Tower of Terror and the Rock 'n' Roller Coaster, it is home to Disney World's most thrill-packed rides. It is already the place to go for a Star Wars fix with Star Tours - The Adventures Continue. But with a major, new Star Wars Land on the way in 2019, the park will be evolving (and undoubtedly become more popular). Continue to 5 of 21 below. Walt Disney World's world's fair-like park includes Future World, which focuses on emerging technologies, and World Showcase, which features pavilions devoted to a rainbow of nations. Among its highlights are Mission: Space, Soarin', and Test Track. It is also where you can find many of Disney World's best restaurants. The two small amusement parks offer two great wooden roller coasters: White Lightning and Mine Blower. They also feature lots of spinning rides, one of the world's tallest Skycoasters, go-karts, and other attractions. It's not really a theme park in the more traditional sense of the term. You won't find the Holy Roller Coaster here (although, that may not be a bad idea!) or any other typical park rides for that matter, but you will find religious-themed exhibits, theatrical productions, and other attractions. Just off the city's famed International Drive (or "I-Drive") tourist corridor, the I-Drive 360 entertainment complex includes the Orlando Eye observation wheel (which is one of the world's tallest), Madame Tussauds Orlando, and Sea Life Orlando. There is also shopping and dining available. Continue to 9 of 21 below. In addition to I-Drive 360 and its Orlando Eye wheel (listed above), International Drive boasts a number of other rides and attractions, each operated by different vendors. They include I-Drive NASCAR Kart Racing, the small thrill park, Magical Midway, and the upside-down ​WonderWorks. The state-of-the-art theme and thrill ride park at Universal Orlando includes the original Wizarding World of Harry Potter (which features the mind-blowing Forbidden Journey of Harry Potter ride), Marvel Super Hero Island and its ​groundbreaking Amazing Adventures of Spider-Man ride, and other great attractions, such as Skull Island Reign of Kong. The delightful Lego-themed park is designed for the 12-and-under set. Among the best things to do at Legoland Florida are Lego Ninjago the Ride, Miniland USA (which includes exhibits of famous destinations made out of Lego blocks), the uproarious Lego Movie 4D, and the lovely Cypress Gardens, which is an ode to the park that once stood on the site. The focal point and by far the most popular, if not the most charming, of Walt Disney World's four parks, the Magic Kingdom is the east coast version of Walt Disney's prototype, Disneyland. It is loaded with highlights including such classics as Pirates of the Caribbean, The Haunted Mansion, and It's a Small World as well as more recent attractions like the Seven Dwarfs Mine Train. Continue to 13 of 21 below. The small family fun center offers go-karts, mini-golf, a sea maze, a huge arcade, mini-golf, and a few rides, including the Hurricane steel roller coaster. It also features a 137-foot-tall Skycoaster. The small amusement park is mostly geared to younger children. In addition to mild spinning rides, attractions include go-karts, an arcade, an indoor play structure, and the Surf City water park. The park has evolved and includes some ambitious rides such as Mako (which gets my nod as Florida's best roller coaster) and Antarctica: Empire of the Penguin to go along with its marine life shows. The SeaWorld chain has announced it will no longer breed orcas and will be phasing out its killer whale entertainment shows in favor of more educational presentations. The Glass Bottom Boats at the state park have been showing guests the underwater wonders of the Silver River since 1878. Other attractions at the nature park include a Jeep Safari and an alligator show. There is a separate admission waterpark nearby. Continue to 17 of 21 below. Scheduled to open in 2020 (although the projected opening has been delayed a couple of times), the entertainment/dining/retail district will include the Skyscraper, a "Polercoaster" which is designed to be the world's tallest roller coaster. Other crazy-tall thrill rides, as well as a surfing attraction, restaurants, an arcade, and places to shop, are also planned. The growing resort boasts two theme parks Universal Studios Florida and Islands of Adventure), the Volcano Bay water park, the CityWalk dining, shopping, and entertainment complex, and multiple hotels. When it opened the Wizarding World of Harry Potter in 2010, its popularity soared. It now offers two Potter-themed lands, one at each park, and the Hogwarts Express train to connect them. The movie-themed park at Universal Orlando, Universal Studios features some incredible attractions, including Despicable Me Minion Mayhem, Transformers: The Ride 3D, and Men in Black Alien Attack. It also is the home of Diagon Alley, Harry Potter's London-based land. 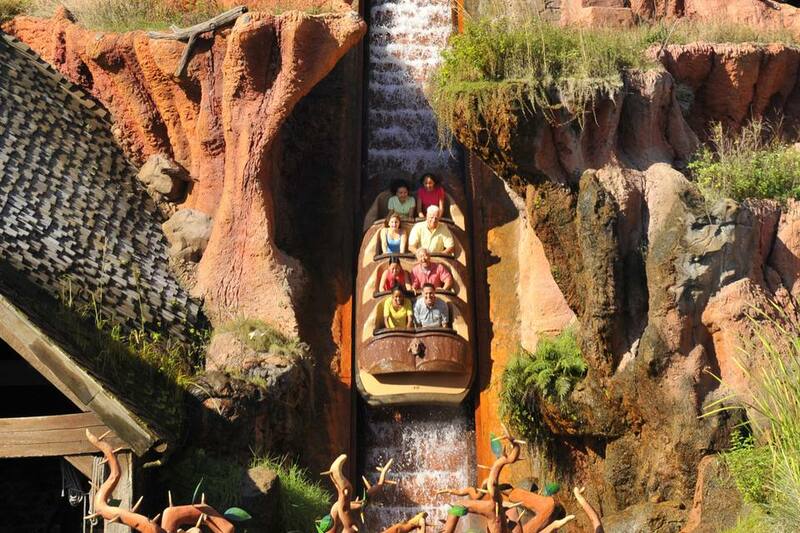 This, of course, is the theme park resort that has evolved and grown to surpass the original Disneyland in popularity. It includes four theme parks, two water parks, the Disney Springs dining, shopping, and entertainment area, and thousands of hotel rooms. It's so huge, it can be overwhelming. If you've never been, or it's been awhile, you may want to get a handle on the best things to do at Disney World to help you plan your visit. Continue to 21 of 21 below. The historic park has been featuring "live mermaids" since 1947. The state park also includes the Buccaneer Bay spring-fed water park, a boat cruise, and an animal show.